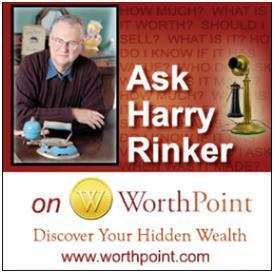 Rinker on Antiques: What Do Our Customers Want? On May 12, I attended Western Connecticut State University’s Macricostas Entrepreneur lecture entitled “Succeeding as an Entrepreneur in Today’s Challenging Economic Environment.” Douglas K. Mellinger, vice chairman and founder of Foundation Source, presented the lecture. Entrepreneurship is inescapably entwined with the antiques and collectibles business. Individually owned businesses dominate the trade, from auction houses to sellers. Most attempts by corporate America to consolidate horizontal or vertical sectors of the antiques and collectibles business failed or weakened rather than strengthened the industry. EBay’s attempt to enter the gallery auction business through the acquisition of Butterfield & Butterfield and Dunning’s is a classic example. Our business works best when the owner is an individual or family, just ask Dan Morphy of Morphy Auctions. Early in Mellinger’s lecture, he asked the following question: “If you are starting a business, what is the most important thing you need to succeed—a great product, a good business plan, a talented workforce, financing or customers?” Obviously, you need all of these. However, if you had to pick just one, which one would you pick? Mellinger’s answer is customers. His theory is a simple one: There is no business without customers. No matter how good your product, your business will fail if there are no customers who wish to buy it. For decades, no for a century, the antiques and collectibles sellers—especially those in the antiques sector—dictated their customers’ wants. They created [I was tempted to use manipulated, but rejected it as too strong a word] the market by what they chose and chose not to offer. The trade press, from periodicals to publishing houses, supported these choices. There was a collecting pecking (snob) order. Collectors and those who sell to them dominated the marketplace. The antiques and collectibles walls of Jericho tumbled as the 20th century ended. The principal purpose of this column is to ask everyone in the trade, myself included, to take a hard look at what we do and ask if the products we offer, whether tangible goods or service products, are what our customers want. Are we still attempting to dictate need or are we responding to demand? Needs change. Mellinger made this point over and over again during his lecture. A good entrepreneur constantly reinvents himself. When market needs shift, he changes. Sometimes he drives change; other times he reacts. What he does not do is stand still. His success hinges on one key principle—providing the product/service the customers want. When asked to define what I do in the antiques and collectibles field, my standard response is “I sell information.” Giving the matter additional thought, a more correct response is “I sell my best guess.” My best guesses are qualitative, not quantitative; based on experience and what my gut tells me rather than statistics. While not a fan of Top 10 Lists, I decided to put my prejudice aside and identify the top 10 antiques and collectibles customers in today’s marketplace. They are not ranked in order of importance. One customer is as valued as another. 1. American Collector (over age 55): This is an old school/traditionalist collector, one who has collected one to five categories for a lifetime. He is heavily influenced by what has been collected in the past. His collections contain the commonly found material. He only wants the upper echelon and masterpiece/ultimate units he does not own. 2. American Collector (ages 40-55): This collector’s focus is post-1945 objects. His primary emphasis is on things relating to his parent’s generation, i.e., the objects with which he grew up. He has multiple collections, changing his approach every six to 10 years, a decision motivated by lack of affordability within a collecting category. 3. American Collector (under 40): A 39-year-old collector was born in 1970. He knows about the 1950s and 1960s and has vague memories of the 1970s. He is “me” focused and into instant gratification. He shops more on the Internet than in the traditional marketplace. 4. International/Foreign Collector: There are two types: (1) the country loyal traditionalist who loves buying back his country’s treasures and returning them to his homeland and (2) the American movie-, music- and television-focused collector. Both groups are big Internet buyers, the first using “live” auction platforms and the second, eBay and direct sale sites. 5. Investor: Antiques and collectibles are nothing more than commodities to be bought and sold. He understands the secondary price market can be manipulated and works actively to do so. He often acts on bad advice from sellers, e.g., auction house personnel and high-end dealers who place their interests above his. 6. Professional Decorator: The professional decorator moves in and out of the market depending on the strength of the economy. Given the state of the current economy, he is a minor player. When in the market, he is a viable sale source for second- and third-level material. 7. Amateur Decorator: The amateur decorator is heavily influenced by decorating/lifestyle magazines. Many of these magazines have moved away from using antiques and collectibles in their decorating schemes. The trade needs more Martha Stewart clones. 8. Trend Follower: This individual uses antiques and collectibles to supplement current decorating trends, whether time period, color, form (animal or vegetable of the month), etc. He creates buying markets that often last no longer than six months. 9. Nostalgia Buyer: The nostalgia buyer is an in-and-out buyer, i.e., he enters the market to buy something he remembers. Because he wants it immediately, he pays whatever is necessary to acquire it, often creating a temporary spike in value. Once he buys what he wants, he is gone. 10. Reuser/Recycler: The reuser understands the “cheaper than new” concept. He uses what he buys, usually for the purpose for which the object was made historically. Affordability is the key to keeping him in the marketplace. Who did I forget? What customers would you add to the list? E-mail me your thoughts at harrylrinker@aol.com. Meanwhile, if you are a seller, take a hard look at your customer base. Are you offering it what it wants? If you answer yes, ask one final question: “How many new customers did I add to my customer base in the past six months?” If the answer is less than five, consider the possibility that your first answer should have been no. No business survives without new customers. Rinker Enterprises and Harry L. Rinker are on the Internet. Check out his Web site. You can listen and participate in “WHATCHA GOT?,” Harry’s antiques-and-collectibles radio call-in show on Sunday mornings between 8 a.m. and 10 a.m. Eastern Time. It streams live on http://www.gcnlive.com on the Genesis Communications Network. “SELL, KEEP OR TOSS? HOW TO DOWNSIZE A HOME, SETTLE AN ESTATE, AND APPRAISE PERSONAL PROPERTY” (House of Collectibles, an imprint of the Random House Information Group), Harry’s latest book, is available at your favorite bookstore and via Harry’s Web site. Harry L. Rinker welcomes questions from readers about collectibles, those mass-produced items from the 20th century. Selected letters will be answered on this site. Harry cannot provide personal answers. Photos and other material submitted cannot be returned. Send your questions to: Rinker on Collectibles, 5093 Vera Cruz Road, Emmaus, PA 18049. You also can e-mail your questions to harrylrinker@aol.com. Only e-mails containing a full name and mailing address will be considered. Please indicate that these are questions for WorthPoint. Join WorthPoint on Twitter and Facebook. What Will The Next Generation Collect? Rinker on Collectibles: Why Is the Antiques Trade So Reluctant to Change?